In-house, fast production, no min. qty. Over 50 colors of plastic, 20 of metal. 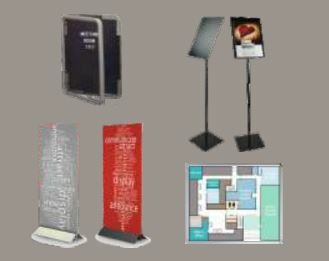 Once piece tent signs. Architectural frames & holders available. Custom sizes available. In-house, fast production, no min. qty. Over 50 colors of plastic, Rounded corners or beveled edges. Architectural frames & holders available. Custom sizes available. ADA compliant options. 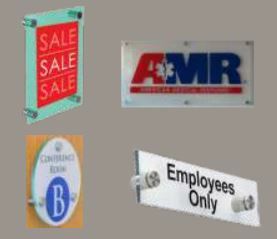 Directories are custom designed to your size, color, and other design requirements. Available in both plastic and metal frames, we will utilize engraving, lasering, and CAD cut vinyl to meet your requirements. The “stand-off” mounting method, along with engraving, lasering, and CAD vinyl on acrylics and/or plastics, provides designs that are unique to your projects. 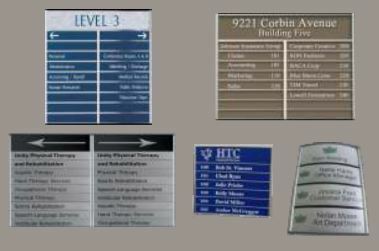 In addition to building directores, lobby signs and stands can greatly assist communicating directions and other vital information to visitors.